We describe here the processes that led scientists to synthesize very useful anti-cancer drugs from highly toxic molecules used as chemical weapons during conflicts. Dangerous chemical weapons have been diverted from their destination for use in therapeutics. There is always concern that the results of scientists’ research may be used for inappropriate purposes, such as terrorism. Here we have the inverse example of the transformation of highly toxic molecules into drugs with controlled toxicity, which are very useful in the field of cancer chemotherapy. It is indeed yperite that gave birth to the first drug against cancer! As for the organophosphates, to dissect their mode of action allowed us to develop drugs against Alzheimer’s disease or glaucoma. The first war gas used in the field was chlorine, 170 tons liberated by the Germans on a 6 kms line, on 22 April 1915 near the town of Ypres in Belgium. Too much subject to the vagaries of the wind, the Germans have sought to develop toxic gases that can be released by projectiles. Other gases will emerge such as phosgene and diphosgene in 1915. On July 12, 1917, the Germans used a new poison, still in the Ypres region: dichlorinated ethyl sulphide, also called yperite or mustard gas. The product is not fatal (mortality rate = 2 to 3%). Very aggressive, it penetrates through the textiles and attacks the eyes, nose, throat, lungs and skin. Its toxicity may be manifested in the long term. Yperite will no longer be used during the First World War even if it was manufactured in large quantities and stored. We haven’t eared of it until 1943. In early December 1943, the port of Bari on the Adriatic was under British military command and served as a logistical base for the allies. In order to slow down the advance of the XIIIth Army and to annihilate the 15th American Air Force, Von Richthofen bombarded the port with a big surprise on the morning of 2 December. The city was not equipped with anti-aircraft defense because it was thought to be beyond the reach of the Luftwaffe. 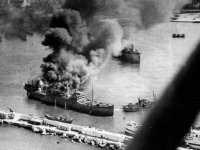 Seventeen ships were bombed, including the John Harvey, which was not distinguished from other ships despite the nature of its cargo. When it exploded, it emited a large quantity of smoke, the smell of which is similar to garlic and mustard. At the center of the attack, there were no survivors on the ship. The sailors of the other boats throw themselves into the sea to escape the massacre, diving into a mixture of sea water, diesel and oil. Of the 628 victims enumerated, 83 died in the week and the others suffered from burns, blindness and respiratory disorders. The presence of a combat gas was no longer in doubt and the Germans were obviously suspected of having used it during the bombing! It soon became clear that the John Harvey contained in his bunkers 2,000 M47A1 bombs, each containing 100 pounds of mustard gas, ready to be a response to the use of chemical weapons by the forces of the axis. Lieutenant-Colonel Stewart F. Alexander, As a vesicant specialist, he noticed that the deads had no white blood cells in their blood. He performed 617 autopsies and concluded that the absence of white blood cells was the consequence of stopping the multiplication of stem cells in the bone marrow. He therefore imagines that if a product is able to slow the multiplication of white blood cells it could have the same action on cancer cells (it is remembered that a cancer cell is a cell whose multiplication is no longer regulated and is therefore capable to give tumors). Edward and Helen Krumbhaar, a pair of pathologists, have already found and published in 1919 that people afflicted with yperite in July 1917 showed signs of bone marrow disease: stem cells no longer multiply, causing anemia (lack of red blood cells) and leukopenia (lack of white blood cells). Only a monthly blood transfusion allowed their survival. It should be noted that the Bari event was hidden and was only revealed in 1946 during a scientific communication by Cornelius P. Rhoad, a pioneer in cancer treatments based on mustard gas. Louis Goodman and Alfred Gilman, were two researchers from Yale University who, as early as 1942, worked under the cover of military secrecy on the physiological effects of yperite. They had synthesized an analogue of yperite, mechloretamine or chlormethine, the sulfur atom being replaced by a nitrogen atom (mustard with nitrogen). This product used in clinical trials performed after Bari, has shown a real effectiveness on lymphomas (lymphocytes develop in an anarchic way in the lymph node system, liver, gastrointestinal …). This drug, also called Mustargen, is still used today, usually in combination, to treat lymphomas. They were developed in the 1930s by IG Farben researchers who were looking for new insecticides. Tabun, sarin, soman, VX and VR are organophosphates. In the field of agriculture, insecticides such as paraoxon, parathion and malathion are well known. ACh acts as a neurotransmitter in many structures of the nervous system, particularly those involved in memory and in various cognitive processes, as well as in the neuromuscular junction. Organophosphates are also called neurotoxics because they inhibit an enzyme, acetylcholine esterase (AChE) responsible for destroying acetylcholine (ACh) to prevent it from accumulating at the synapses by causing a cholinergic crisis (hyperstimulation of the organs ). These violent poisons inhibit AChE in an irreversible manner. A number of diseases originate, at least in part, in an insufficient concentration of ACh. This is the case, for example, with Alzheimer’s disease, glaucoma or certain myasthenia gravis. The study of organophosphates showed us that by inhibiting AChE they prevented the increase of the ACh level. However, some diseases are due to an insufficient concentration of ACh. From this it was deduced that by using AChE inhibitors it was possible to increase the level of ACh there was only one step that was crossed which was done with reversible inhibitors. The use of reversible inhibitors can therefore raise the level of ACH. They are inhibitors either competitive in preventing substrate binding ACh or non-competitive by decreasing the efficiency of the enzyme by altering its spatial conformation. Alzheimer ‘s disease is very complex. The ACh deficiency is the oldest pathway explored and it may be one of the reasons for the disease with the formation of the amyloid protein in the neurons. The inhibition of AChE makes it possible to raise the level of the ACh. Drugs have been developed: they treat the symptoms and not the causes but improve certain capacities of the patient. They are: tacrine, abandoned because of the important side effects, donepezil (ARICEPT), galantamine (REMINYL) and rivastigmine (EXOLON). They aim to increase the availability of acetylcholine and promote communication between neurons. Moreover, in several neurodegenerative diseases, there is an increase in glutamate that is deleterious for neurons. The aim of Memantine (EBIXA) is to reduce this toxicity. These drugs have no long-term efficacy and do not slow the progression of the disease. This type of molecule is also used for other diseases: physostigmine against myasthenia gravis, but it is no longer marketed because of its side effects, echothiophate and diisoproppylphosphofluroridate against glaucoma.